Rubython was once publisher of a business magazine and his book follows the money. 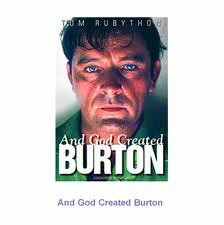 When Burton’s career runs into a lull he realises he will “run out of money in 10 years at his current rate of burn.” Previous biographers have passed on the list price of a convertible Morris Minor in 1956 or the cost of a hotel room in Toronto. It is here in grinding detail. A fee expressed in dollars gets not just the exchange rate at the time but the tax rate, so the reader knows exactly the net figure. The detail extends to a government grant (£200) to help with the first house in Lyndhurst Road. “When told he had earned $1m in 2 years” we learn “his ears pricked up and he smiled widely.” No evidence is given. But then this is acting. “The scorecard” after all “in his profession, at the end of the day, was always money”. There is a magnificent flatulence to the writing. On meals in childhood “Mother fed them an English [sic] diet consisting of sausages, faggots, pies, boiled ham and real cuts of meat; all invariably eaten with boiled potatoes and bread along with leeks and vegetables.” An assistant cannot simply hurry to Switzerland but “checked in at Los Angeles airport ready to take the late evening flight direct to London and then on to Geneva. The time difference meant that Douglas landed early in the morning and caught the first British airways flight to Geneva.” No plane, and there are many, comes without its status and brand name being recorded. Some of the asides are arresting, but the reader wonders as to their accuracy. Alcohol coats a spine in crystals that need to be scraped off. As for Wales’ quality of public administration “Birth certificates in South Wales were notoriously inaccurate in that period due to most of the registry staff being notorious alcoholics.” The rules of the Revenue in 1983 reportedly had it that a body repatriated to Britain affected an estate’s inheritance tax status. Rubython makes a sly aside, apropos of nothing, about the 1945 Attlee government. At war's end it does not instantly abolish rationing “for reasons best known to itself”. Well, no, the reasons were clear. Forty years later, Britain enthusiastically re-welcomes the overthrow of socialism and envy politics. As for the proof-reading, mentor Philip Burton, “a creative genius”, is “the svengali who literally manufactured Burton.” Less Svengali than Baron Frankenstein. Paul Scofield becomes Schofield, and back again in succeeding sentences. Family member Rhianon Trowell loses an “l” and T S Eliot gains one. Selznick is “Selzncik.” A “had” disappears from a pluperfect. A string of commas vanishes to be replaced by semi-colons. “If he was” is replaced for “if he were”, to comic effect. “To embark” becomes transitive. “Ensconced” is used twice in successive sentences. Elder brother Ifor is Ivor throughout. This behemoth of English prose contains two short sentences in Welsh. One makes it through correctly. And yet. There is something rather heroic about a venture so gigantic, done with such ferocity of effort in so short a time period, but where the author is so little at home, where copyright holders are so unhelpful. In an unorthodox authorial preface Professor Alan Miller of Cardiff University “is a wonderfully open man” but the archive at Swansea University is cursed for a lack of co-operation.